People will soon have a new way to bike around Fayetteville. 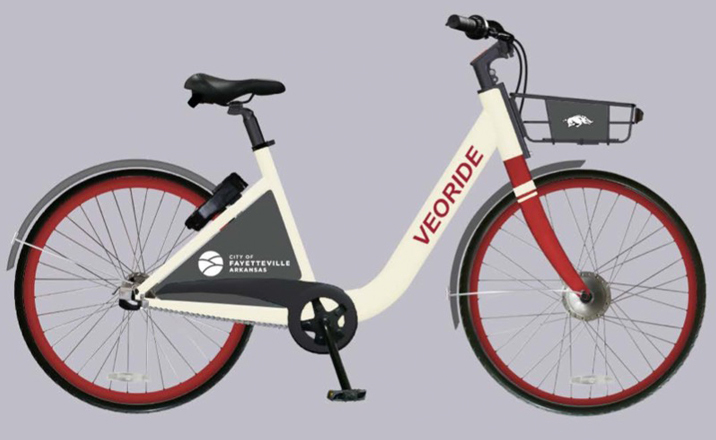 City Council members this week approved a contract with VeoRide, an Indiana-based bike-share company. The contract grants VeoRide the exclusive right to operate a bike-share program in the rights-of-way within the city limits for three years. The company operates programs in nearly 20 cities, including Austin, Texas; Lawrence and Pittsburg, Kansas; and Champaign, Illinois. The city partnered with the University of Arkansas and the Fayetteville Advertising and Promotion Commission to bring the program to town. The city and university have each agreed to pay $20,000 annually with the A&P Commission adding $10,000 to help subsidize the cost for residents and visitors who purchase subscriptions for bicycle usage. 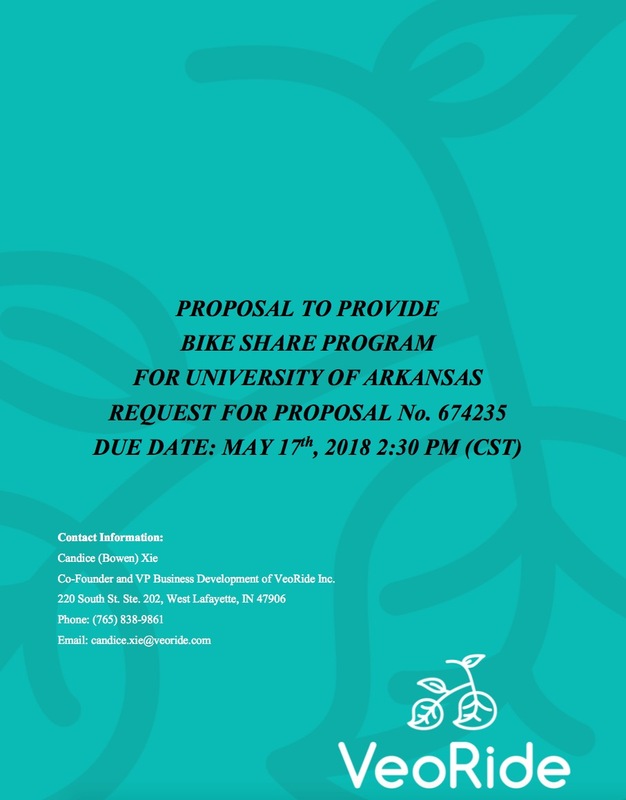 The program is set to launch in September and will include 290 standard 7-speed bicycles and 50 pedal-electric assist bicycles with custom branding featuring Razorback colors and logos of the university, city and Experience Fayetteville. Bicycles will be available for pickup in and around the downtown are, along city trails, on the UA campus and at other locations. VeoRide will offer free rides the first two weeks of the program launch. After that, discounted subscriptions will cost $17 per month or $70 annually for regular users. Students, faculty and staff of the Fayetteville Public Schools and the University of Arkansas will pay $10 monthly or $35 per year. Subscriptions for low-income residents will be $4.99 per month or $28.99 annually. Subscribers will receive unlimited one-hour rides. Overage fees would be 15 cents for every 15 additional minutes. A subscription is not required to ride, however. Pay-per-ride fees are 50 cents per 15 minutes for the standard 7-speed bikes. A $1 unlock fee will be required to ride an e-Bike, and the cost is 10 cents per minute after that. City staff said the plan is to work with VeoRide to use geofencing technology to designate preferred parking areas that include bike racks, painted bike parking spots, or any other areas. Geofencing may also be used to create no parking zones in areas with higher pedestrian activity. Like most bike-share programs, the Fayetteville system will operate using a cellphone app that connects to a credit or debit card. 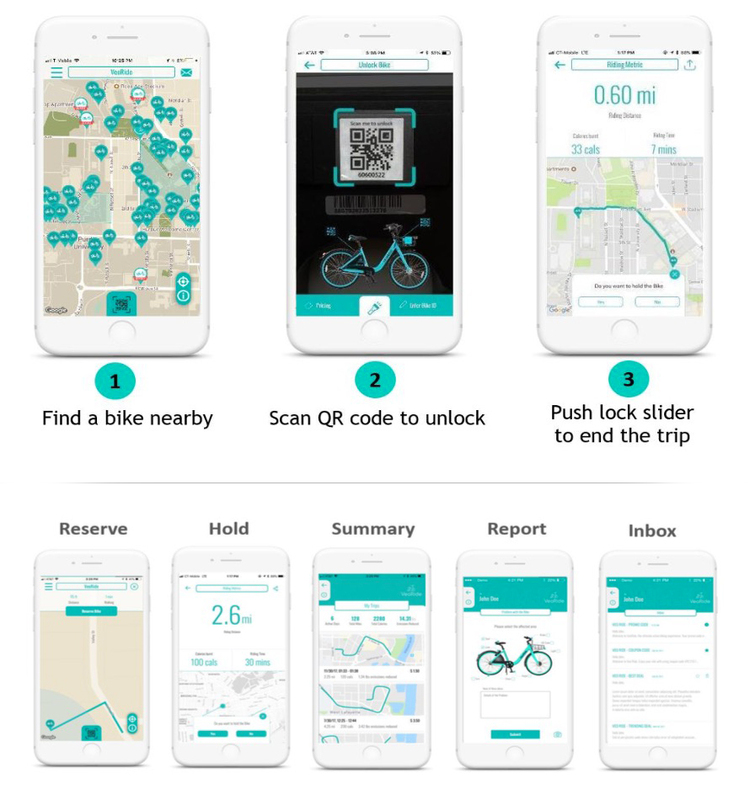 The app can be used to find a bike, unlock the bike, and then locate a designated parking area. For those who don’t have a cell phone, cards can be purchased to unlock the bikes. Cash can also be used to add funds to a user’s account. To view program details, including a staff memo to City Council members and the VeoRide contract and rules, download the council item packet.